Since Porches is the band that inspired this week’s theme, it’s worth noting why it received this distinction. Prior to hearing Porches’ upcoming album Pool—its first for Domino Records—I didn’t “get” the band. Given the fact that the Porches name is ostensibly an umbrella for bandleader Aaron Maine to chase his muse, it’s not surprising that the early Porches releases could be spotty. It’s not that the band’s music was bad—a song would strike a chord here and there—but Maine’s mish-mash of styles and approaches left me wanting something more cohesive—something that made Porches feel like a band and not just a recording project. With the release of “Be Apart”—and subsequently Pool—I finally got what I wanted out of a Porches release. Though the band has always had a pop focus, Pool shifts away from Maine’s amalgam of country, indie, and rock influences into full-on electro-pop. 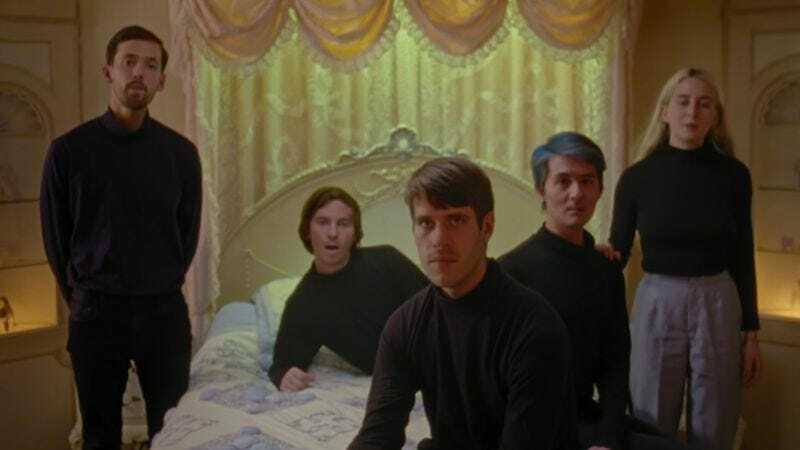 While Porches could have previously been considered a rock band with an occasional electronic flourish here and there, “Be Apart” removes the “rock” descriptor almost entirely, revealing an entire new side of the band. Maine’s voice is as powerful as ever, but on “Be Apart” the edges are smoothed, and his lusty lower register makes for a song that could soundtrack a sultry dance party instead of a sweaty basement show. “Be Apart” sets the tone for Pool, which dives head-first into these new waters. Maine boldly shows that he isn’t the least bit beholden to his past—and Porches is all the better because of it.